6th Grade: Tanner B., David B., David Z. 7th: Grade: Diego HM., Madi C., Julia O. 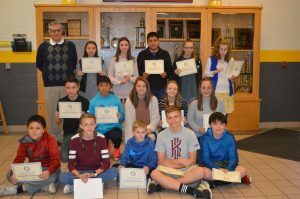 8th Grade: Janice L., Scarlett S., Payge B.
Encore: Jonathon F., Hannah D., Abbie B., Max C., Payton T., Geovannye CO., Anaston B.